Please Note: Model is shown with optional support base. This model is the 240 volt model. It includes a 3-wire grounded cord and plug for safety. This item is a sterilizer, not a canner. It is not suitable for use as a canner. Things to know before you purchase your new All American Sterilizer. 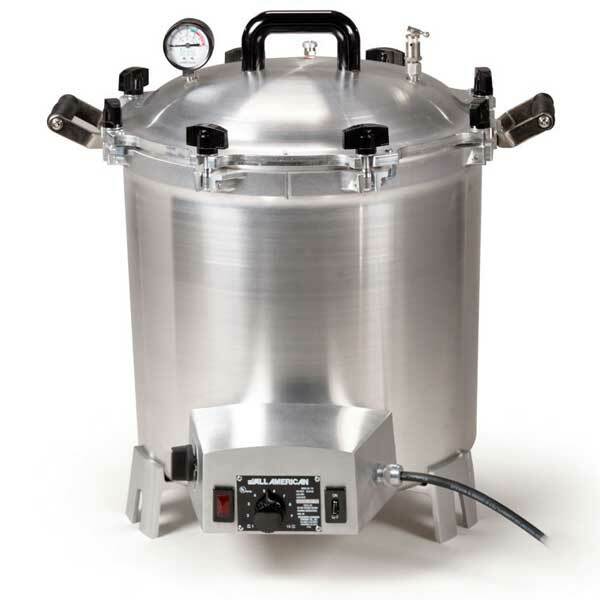 The All American 75X 240 volt Electric Autoclave Sterilizer is a complete, self-contained sterilizer machine with an immersion heating element, automatic thermostatic control, automatic release valve, and pilot light. It connects to any outlet, is ready for use instantly, and ensures complete, efficient sterilization. Only All American Sterilizers feature an exclusive, precision machined "Metal-to-Metal" sealing system. Positive action clamping locks align the cover to the base forming a steam tight seal. Because no gasket is involved, the cover is always easily opened and closed. Only a small amount of water is needed to create the dry steam. After achieving a minimum temperature of 250?F(121?C), and a pressure of 17psi, the dry steam penetrates the bandages or instruments, making them sterile in 35 minutes and ready for immediate use. No wiping is necessary to remove chemical residue or moisture, and cutting edges are not dulled. Why can't I use tap water in my sterilizer? What is the optimal autoclave temperature and pressure for sterilization? How do I choose which sterilizer to purchase? Why are there water marks on the inside of my new sterilizer? What is the difference between the 120 Volt and the 240 Volt Sterilizers? Why would I need a support base for my electric sterilizer? will be charged a 20% restocking fee and shipping cost is non-refundable. All American Electric Sterilizers are available in both 120V & 240V models, and will operate on either 50Hz or 60Hz. All models include a 3-wire grounded cord and plug for safety. An optional support base elevates the sterilizer above the table or counter surface to prevent heat damage. Attention Buyers: These items are sterilizers, not canners. They are not suitable for use as canners. **Sterilizer period begins when the pressure steam gauge needle register in the green sterilization band shown of the face of the gauge and a minimum of 17psi has been reached. The time required before this period for the sterilizer to heat will vary depending on the size of the sterilizer and the temperature of the water used.